Here's a check in on the characters who haven't explicitly removed themselves from the chapter. Some are having a better time than others. 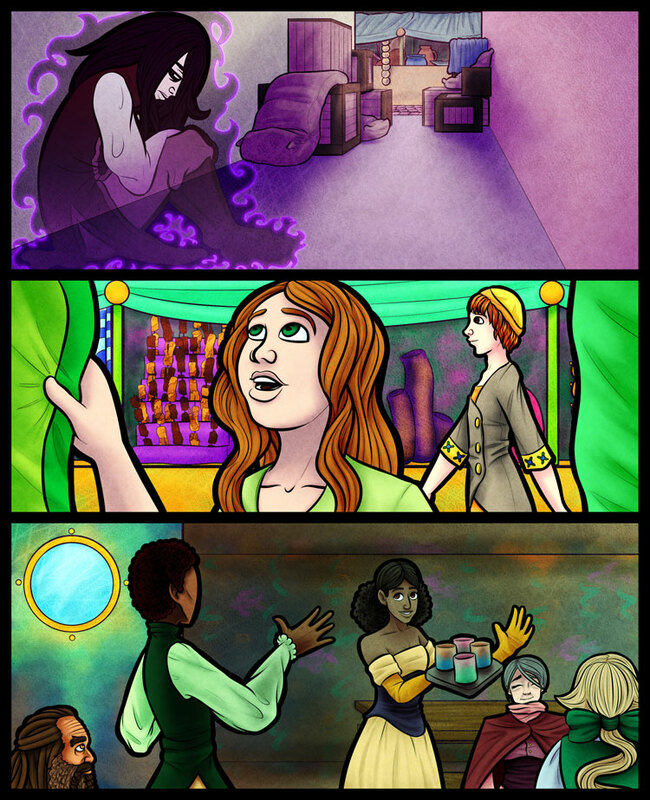 In the middle panel is Teren from The Adventures of Aquila and Teren. In the last panel is Kanny Bougainville from Cryptida and Cynthia from Once Stung. Also, a new page means updates once a week for the next month. The following four pages are almost done and done to the point that I'm confident they'll all be done this week. I'm also working on a HUGE surprise for you guys that I'm hoping I'll be able to reveal in June. Also, also, I've got a lot of news to share since the last update. Check out this animation I made for science! And be sure to check out the video my colleague, Ning, filmed and created that the animation was made for. Also be sure check out Ning's other videos. He's doing a lot of really great work (most of which isn't online, yet) and, I believe, is entirely self taught. He's about to start working towards a PhD, creating quality geoscience videos to educate people. One last thing, I'm thinking of setting up Eternity Complex on tapastic/tapas. Don't worry, there will still be updates here but I primarily read webcomics on mobile and their interface is super mobile friendly. If you have experience with tapas please let me know what you think and if you have any advice for setting up the comic over there. As for Tap. Really up to you. I will unfortunately admit that the long break threw me out of loop when it comes to this story and I also have less time to follow that many. If you start uploading from the beginning on Tap then I might start over with this comic there. If I start updating on Tap, that's exactly how I plan to do it. Regardless of whether I start updates at a page once or twice a week. There's enough content in the archive for regular updates there to last through my defense and possibly through a post doc as well. Also, if I do start updating over there, please don't feel like you need re-follow the story. Time is a precious commodity and I don't want to waste yours with a story that may not finish in a reasonable amount of time. He's definitely seen better days.